High rise buildings benefit from having fire sprinkler systems and can be installed during the build or retrospectively. Sprinkler systems installed in accordance with BS9251 can be very cost effective and as little as £400 Per flat. An example of a retro fit is Callows Mount in Sheffield where 47 residents in a 38-year-old high-rise residential block are now amongst the safest in the UK when it comes to fire protection. In 2011 the British Automatic Fire Sprinkler Association, after considerable discussion with Sheffield City Council, Sheffield Homes and South Yorkshire Fire & Rescue Service, took the bold decision to fund a retrofit installation of an automatic fire sprinkler system in Callow Mount, Sheffield without the need to disrupt the lives of the residents or require anyone to be decanted during the installation work. 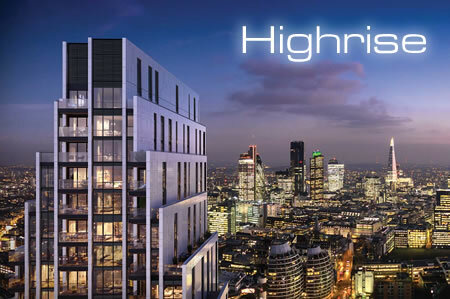 New build high rise buildings over 30m must have fire sprinkler systems installed to comply with the requirements of Approved Document B of the Building Regulations. Triangle Fire Systems can design, supply and install a compliant BS9251 fire sprinkler system that will be cost effective, aesthetically pleasing and keep maintenance costs to a minimum. TFS have recently installed fire sprinklers to high rise buildings at Vauxhall Sky Gardens and Dexion House in Wembley. See our Case Studies page for further details.